PALO ALTO, CA--(Marketwire - October 13, 2010) - Almost every brand, person and organization has built, or is building, a web presence. The proliferation of social technology has made it critical that every one of these websites will need to be social. Today, Ning, the world's largest platform for creating custom social websites makes that easier with the launch of Ning Everywhere. Ning's API (Application Programming Interface) offers unparalleled control and flexibility for Network Creators and third party developers to integrate and innovate. Now, every Ning Network can be a digital hub, integrating with leading cloud and social services like Twitter, Facebook, and Seesmic, accessible from every device, and extensible for those wanting to build custom applications. Ning makes it easy to create highly customizable and powerful social websites for musicians, fans, brands, political organizers, non-profit organizations, and more. Ning Everywhere is the latest evolution in social platform development, and offers even stronger ways to integrate and extend your Ning social website. "Consumers have changed their expectations on how and where they will consume social," said Jason Rosenthal, CEO, Ning. "Ning Everywhere gives our customers new and deeper ways to customize their Ning social experience and make it accessible on any device." Mobile Application Creation: Partnerships with several mobile application creation platforms make it quick and easy to create branded mobile apps for Ning Networks. Premium: Mobile Roadie and Double Dutch provide a simple way for Network Creators to build sophisticated, professional looking mobile apps for Ning communities. Do it Yourself: AppMakr and Double Dutch offer cost-effective ways for Ning Network Creators to build their own mobile applications. Ning Extensions: With Ning Extensions, the best of the web -- and the best of Ning -- are now closer than ever before. Seamless and elegant integration with leading cloud services offers Ning Creators and members new features to extend the power of their Ning communities. With the click of a button, Ning Creators can enable Seesmic, Constant Contact, Aviary, CafePress, heyZap and Skimlinks on Ning Networks, providing new ways to monetize and connect. Custom App Development: With the Ning API, Network Creators can build their own applications with help from fellow developers, making deep integration easier and more opportunity for creativity to run wild. "Constant Contact and Ning share a common passion and commitment to making social media simple and accessible for our customers," said Steve Johnson, vice president of partners, Constant Contact. "The combination of our complementary technology platforms helps small business customers extend the reach and impact of their Ning communities through the power of email marketing." "We are very excited to team up with Ning. By combining the largest mobile app platform with the largest custom social platform in the world, we believe we are making it easier than ever for our customers to have a cohesive digital presence," said Michael Schneider, CEO, Mobile Roadie. Seesmic -- The Seesmic Desktop, an application that allows you to follow activity across multiple social networking services and post status updates from one easy-to-use location, now supports full integration from Ning Networks. Aviary -- This suite of content creation and development tools, ranging from graphic design to audio and effects editing, provide Ning Networks with high-quality services for artists of all genres. heyZap -- Social and casual games have brought websites increased traffic, user retention and engagement, and additional income streams. Ning and heyZap have teamed up to provide deeper integration of social gaming into the Ning platform, so that Ning Creators can monetize via in-game microtransactions. CafePress -- As the world's biggest destination for self-expression through merchandise with more than 11 million shoppers visiting shops each month, CafePress provides an easy way for Network Creators to create and sell merchandise and monetize their Ning Networks. Skimlinks -- This service simplifies affiliate marketing for web publishers, enabling content to be monetized through commissions from more than 12,000 merchants. By integrating into Ning, Skimlinks lets Network Creators convert normal links into affiliate links, turning product references within content into relevant, geo-targeted shopping links. Ning Everywhere provides the tools and resources to enable brands of all shapes and sizes to create integrated and customized social experiences wherever their audiences go. To learn more, please visit www.ning.com. Ning is the leading online platform for the world's organizers, activists and influencers to create social experiences that inspire action. For brands of all shapes and sizes, Ning makes it easy to build custom and powerful social websites. Ning Networks span categories like politics, entertainment, small business, non-profits, education and more, connecting millions of people every day around the topics they are passionate about. 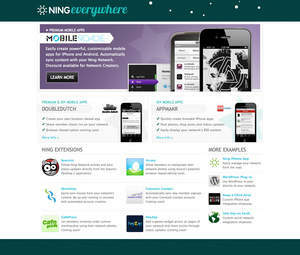 Palo Alto, Calif.-based Ning was co-founded in October 2004 by Chairman Marc Andreessen and is privately held. For more information, visit www.ning.com.